Dear Lord, heavenly Father, thank you for making our lives rich with meaning and hope. When my life is surrounded by Jesus, coupled with Gospel faith, everything become flavorful. Our joy increases. Walking the dog and talking my son to a baseball game has new meaning. Everything becomes full and rich. Thank you for the gift of the gospel. I pray that multitudes of others may find even deeper joy in Jesus than I have found. May the ISBC be a source of joy to 3,000 people. Please grant me your word through this passage. I pray in Jesus’ name. Amen! God loves the world. He loves this world so much that he sent his One and Only Son into the world to redeem fallen mankind back to himself. All of creation is waiting in joyful expectation for Christ’s return. But the holy God is angry when he is ignored and when his people, whom Jesus died to save, turn their backs on him and decide to walk in darkness. They are actually suppressing the truth about God by living in sin. God reveals his wrath by removing his hand of care and restraint (24,26,28) for a time, so that mankind might suffer in slavery to sin and repent. It is not actually God inflicting punishment on us. It is the consequences of our sins for living life without him. I need to live in Christ. I need to not suppress the truth of God and his Gospel by choosing to live in a certain way. My life and my family should reveal Jesus. That is what glorify means. It means to reveal. If you are not revealing God, you are suppressing God. If you are not advertising the Gospel you are advertising self. May my life reflect the glory of Jesus. There are some basic truths of God that should be upheld. There is one God. 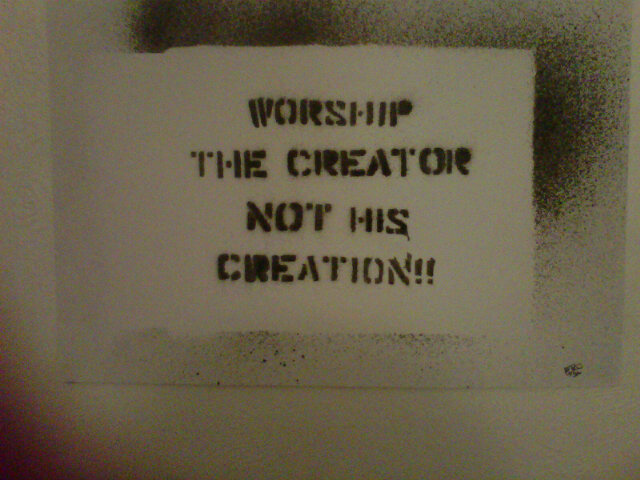 He is the Creator. God is the Sovereign Ruler. All truth begins here. God revealed himself in the creation. He is love. He sent his Son Jesus into this world to open the way to eternal life through his suffering, death and resurrection. He is eternal. He wants us to dwell in eternity with him. He is the source of truth and true righteousness. To me, it is pretty obvious what the qualities of God are and when we uphold them and reveal them to the world in our lives, in our families and our churches and communities then we are revealing the gospel to the world. When men deny God, ignore his laws and live according to their sinful natures, they suppress the truth. When we obey God as our Creator and Lord, we have truth in our hearts. I pray that God may help me to obey my Creator and advertize the Gospel to the people around me. God made a beautiful world and provided everything mankind needed to be happy. We must thank God for all that he has done for us and provided for us. God has provided everything for me to serve him and to raise my family. Things don’t get much better than what he has provided. (The only thing that I don’t have is free healthcare. If I get sick I can loose it all trying to stay alive. But so far he has blessed me with relatively good health.) God has even given me a supportive church and a mission field. He is healing our family spiritually. Mark and I started Bible study once again. Jenn is “exploding” with Gospel faith. Mostly Jesus has given me an abundance of grace and truth and eternal life. Everything is overflowing from the God. How should I respond? I need to “honor him as God or give thanks to him” I must also never exchange the glory of the immortal God for idols. I must make Jesus the object of my worship and love him with all my heart, mind and soul. It is when we fail to give thanks and worship him as God, that all of the problems arise. Pride and ingratitude are the roots of sin. When we are not thankful, we become critical. When we do not honor God as God, pride becomes our master. When God is not worshipped as God, then people make foolish exchanges. (23,25,26) Like exchanging the glory of the immortal God for images resembling mortal man and birds and animals and creeping things. Like exchanging the truth about God for a lie and worshipping and serving the creature rather than the Creator. People also exchange natural relations for those that are contrary to nature. When we exchange truth for a lie, we suffer the consequences of a futile mind, darkened hearts and a defiled body. There are some cultures that actually worship created things rather than the Creator. People give their hearts to idols rather than the one true God. And these people are led astray. We can see it in individual lives and we can see it in whole cultures. There are consequences for taking the eyes of our hearts off of the Creator. We in America worship created things as we take our eyes off of our creator. We worship our bodies almost obsessing with fitness and health. We obsess with the exercise of human freedom. We obsess with out possessions like our clothes, our homes, our cars. We worship our careers. We worship our kids. If we gave only half the focus we give to things of this world, to our Creator, we would be super sincere Christians. In some ways I have fallen into worshipping my freedom, health, my body rather then giving all my heart to my Lord and my God, Jesus Christ. In his book, “Whiteman’s Religion” Craig Smith (who is Ojibwe) stated that these words in Romans speak true to the Native people. He claims that the Native people fell away from the Creator by worshipping the creation instead. This marked the ancestral ways of the Native people in North America. He states that this has ramifications. “When God’s highest creation looks to creation rather than the Creator for spiritual guidance and direction, and even worship such created forms, an inverted form of pure worship and spiritual guidance in the end result.” (p. 18. Whiteman’s Gospel) He states that when we do this we are rearranging God’s divine order of creation. We end up putting lower levels of creation above ourselves. We were actually meant to rule over the things we now worship. It is impossible to get spiritual guidance from the things that we have elevated to the point of reverence. We are doing a disservice to our own status as human beings by elevating created things to such a status. It diminishes the sanctity of the relationship and the special status that exists between God and human beings. Why can we not celebrate God’s creation, learn from it, be thankful for it, protect it without worshipping it? Let’s get back to the worship and service to our Creator God, the Creator of the heavens and the earth. Prayer: Lord, give me a thankful and humble heart every day. One Word: Thank God and honor him as the Creator God.